PYONGYANG, North Korea (AP) — North Korea's highest court sentenced an American tourist to 15 years in prison with hard labor on Wednesday for subversion. He allegedly attempted to steal a propaganda banner from a restricted area of his hotel at the request of an acquaintance who wanted to hang it in her church. 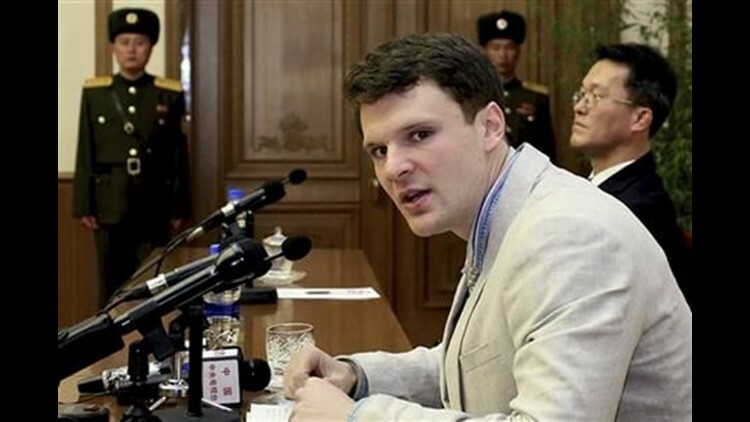 Otto Warmbier, a 21-year-old University of Virginia undergraduate student, was convicted and sentenced in a one-hour trial at the North's Supreme Court. He was charged with subversion. Warmbier was arrested as he tried to leave the country in early January. He was in North Korea as a tourist with a New Year's tour group. In a statement made before his trial, he told a gathering of reporters in Pyongyang he tried to take the banner with a political slogan on it as a trophy for the mother of a friend who said she wanted to put it up in her church. North Korea announced the arrest in late January, saying he committed an anti-state crime with "the tacit connivance of the U.S. government and under its manipulation." Warmbier had been staying at the Yanggakdo International Hotel, which is located on an island in a river that runs through Pyongyang, the capital. It is common for sections of tourist hotels to be reserved for North Korean staff and off-limits to foreigners. In his comments, Warmbier said he was offered a used car worth $10,000 by a member of the church. He said the church member told him the slogan would be hung on its wall as a trophy. He also said he was told that if he was detained and didn't return, $200,000 would be paid to his mother in the form of a charitable donation. Warmbier, from Wyoming, Ohio, said he accepted the offer of money because his family is "suffering from very severe financial difficulties." U.S. tourism to North Korea is legal, but the U.S. State Department strongly advises against it.